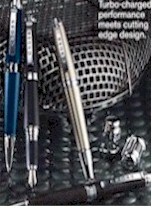 Cross Pens:C-Series: pens that change from rollingballs to ballpoints, and the rollingballs don't require caps! Turbo-charged performance meets cutting-edge design. Industrial design detailing and finishes inspired by fine sport cars give this pen a high-tech look: chrome lug-nut appointments, rhodium plated solid 18kt gold nib, twist-off cap and rubberized front section on Fountain Pens.